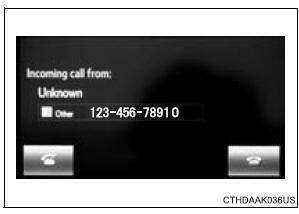 When a call is received, the following screen is displayed together with a sound. Turn the “PWR•VOL” knob. You can also adjust the volume using the steering switches. Received international calls may not be displayed correctly depending on the cellular phone in use.